Donald Trump didn't win the popular vote but after he won the election and the reality of him becoming president began to set in, his poll ratings actually went up. Nearly 100 days later, Trump's approval rating appears to have settled after a bumpy start. As can be observed on both the RealClearPolitics polling average and the one collected by the HuffPost Pollster project, toward the end of December of 2015, Trump's unfavorable rating took a bit of a nosedive. He still was "underwater" as pollsters call it when more people view a politician unfavorably than view her or him positively, but undoubtedly, Trump was moving in the right direction. The weeks of chaos and uncertainty haven't helped Trump's approval ratings since then, however. In both charts, the president has stood at more than 50 percent disapproval since the middle of February. But what about his policies? That's where a new report that was released today by the non-profit PRRI comes in handy. According to PRRI, most of Trump's policies seem to be opposed by the general public. 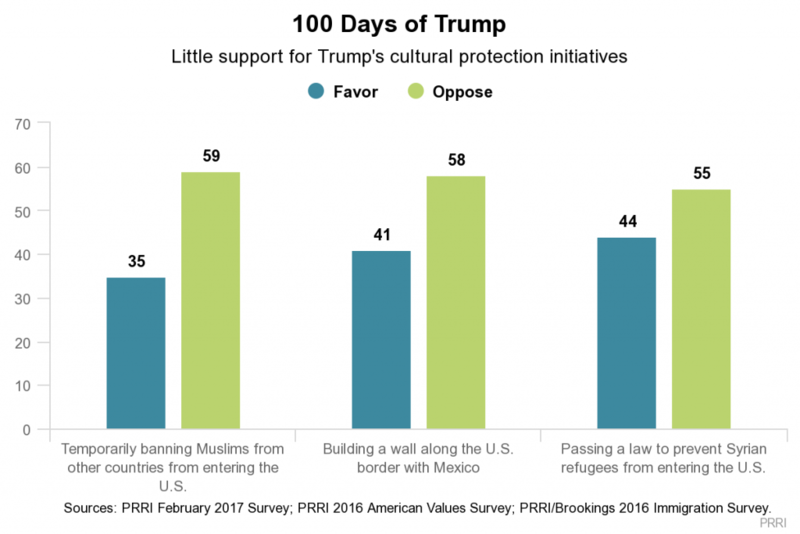 In a February PRRI survey, Trump's executive order that temporarily banned people from certain Muslim-majority countries from entering the United States attracted just 35 percent support. His famous border wall with Mexico proposal attracted 41 percent support, while 44 percent supported his idea of blocking Syrian refugees from entering the U.S.
Trump's idea of deporting illegal immigrants is even less popular than the above policies. According to PRRI, 64 percent of Americans favor some method of allowing undocumented immigrants to become citizens, 15 percent want them to be eligible for permanent residency but not citizenship. Just 16 percent favor deportation. Two of Trump's policies in the PRRI research are viewed more favorably than unfavorably, albeit just barely. By a 50-43 margin, Americans say that free trade agreements are more harmful than helpful. Trump's other notable achievement, approving the Keystone XL oil pipeline, was supported by 52 percent. Trump will have to find some way to turn things around for himself if he wants to win re-election, at least if a just-released poll by Fox News is to be believed. According to that survey, just 36 percent of around 1,000 registered voters said they would "definitely" or "probably" vote for Trump.